The bunk room will have 2(two) sets of twin bunk beds to include mattresses and mattress pads. 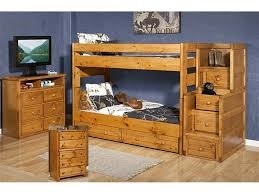 In between the two bunk bed sets will be the stairway chest, which has storage. In between the two windows will be a media chest.